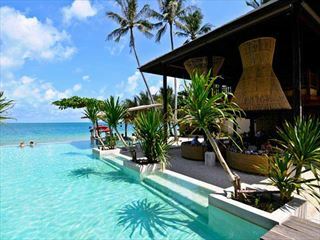 There's no disputing the natural beauty of Thailand and, at this Santhiya resort on Koh Phangan you'll find yourself enveloped within a tropical oasis full of charm and eco-friendly luxury touches on this quite and peaceful private beach. 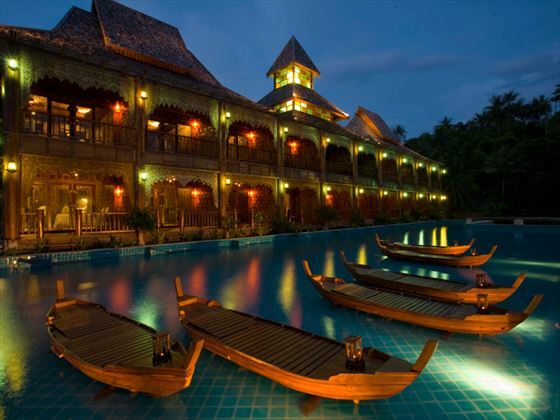 The accommodation is a joy to behold and if you're looking to add unique to chic then you'll be more than satisfied with the ornate teak décor and arched veranda entrances which help to highlight glorious blue ocean and lush green garden scenery. With a full range of first-class facilities, including a beautiful spa and vast free-form swimming pool, there's plenty to get excited about and if you're hankering for the ultimate in romantic meals for two then make sure to reserve your own private rendezvous at the setting of your choice. 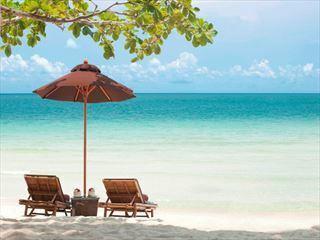 Set upon eighteen acres of lush, tropical landscapes on the West Coast of Koh Phangan, the Santhiya resort holds the perfect backdrop for your serene, luxurious getaway, with dense, emerald green forests, golden sands and crystal clear waters in every direction. 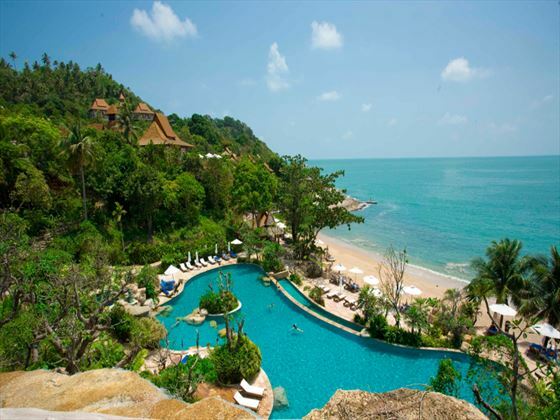 Lots of pristine beaches are dotted around nearby to your resort, including the gorgeous Thong Nai Pan Yai Beach, filled with laid-back bars and eateries, and the Ao Thong Nai Pan Beach, right on your doorstep. 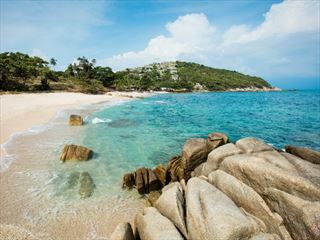 Bottle beach is just over 20 minutes away, offering pristine white sands, calm waters and a very tranquil atmosphere; if you’re feeling adventurous, the hike to this beach takes just over an hour. For a relaxing and interesting day trip, embark the Chantara boat, a traditional Asian sailing junk boat that cruises the Gulf of Thailand to discover Koh Samui and its neighbouring islands. Explore the colourful marine life of the surrounding waters in a snorkel tour; the Dreamland Diver provides a great diving trip and all of the equipment you’ll need to explore the depths of the ocean. Speed boat and private car transfers add to the exotic excitement value, taking around an hour in total from Koh Samui International Airport. 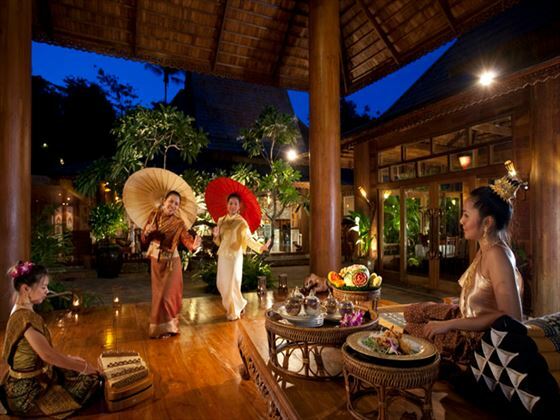 Chantara Restaurant – Thai and international gourmet dishes and wines served within an incredibly exotic location overlooking the gardens and ocean. By the Sea Restaurant & Bar – alfresco snacks, drinks and lunchtime bites served right on the beach from 10am till 11pm. Private Dining – reserve your setting for the ultimate in romantic dining experiences or simply decide to dine within the comfort of your own room. Ayurvana Spa – signature massages, scrubs, facials and pampering packages within earshot of the gently lapping ocean waves. Exclusive rates for children under the age of 14 as opposed to under 12. 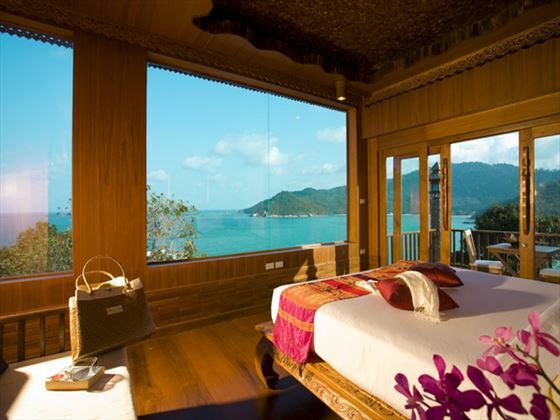 If you're looking for a laid back retreat with a stunning beachfront location and exceptional service, the Anantara Rasananda Koh Phangan Villas is a perfect choice. 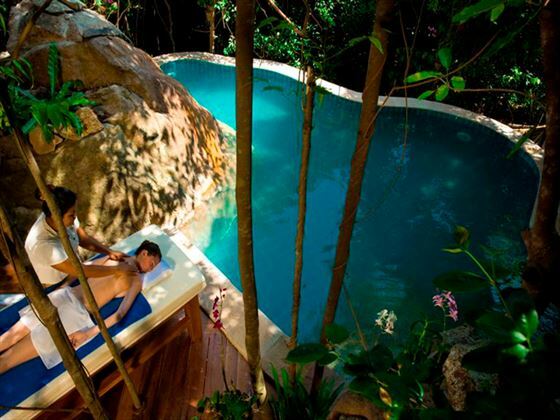 Situated away from the hustle and bustle, this is barefoot luxury at it's best. 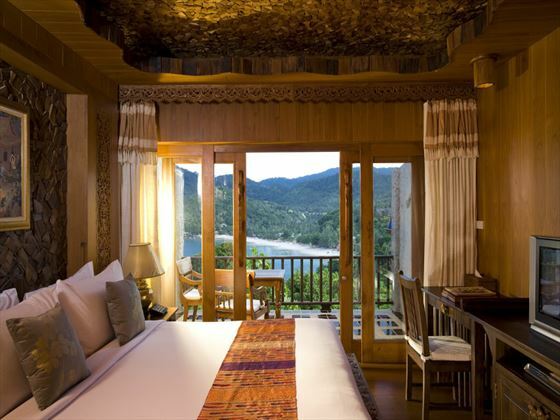 An enchanting boutique resort, Buri Rasa Village is the perfect beach hideaway. The intimate atmosphere and secluded location make it ideal for stress-free holidays where the attentive staff will ensure your stay is relaxed and truly unforgettable. 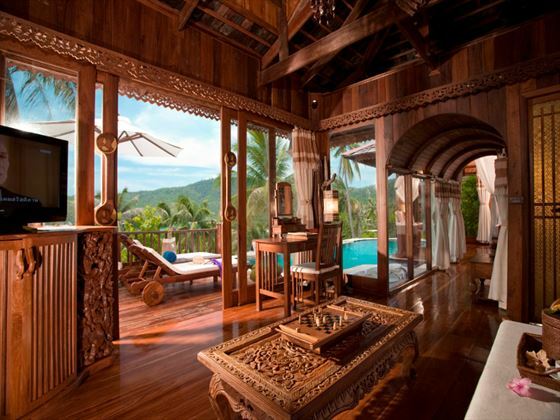 A stunning boutique hotel offering suites & villas, located on the popular Bophut coast of Koh Samui. 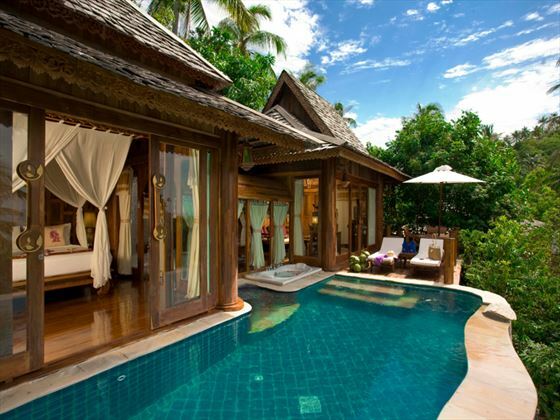 Relax on the stunning beach or cool off in your own private pool, this is a true luxury experience.